The California Highway Patrol released the 911 call for the latest Toyota to allegedly zoom out of control. Still sounds fishy to us. If pressing hard on the brakes and turning off the engine worked, why did it take 23 minutes and a cop with a bullhorn to figure that out? EL CAJON, Calif. (AP) — The driver of a Toyota Prius that sped out of control on a San Diego County freeway sounded panicked at times as he told a dispatcher about a stuck accelerator. A 23-minute 911 call the California Highway Patrol released Tuesday details James Sikes’ attempts to slow his car down as it reached speeds over 90 mph. Sikes told authorities that the accelerator malfunctioned as he drove on Interstate 8. The car reached 94 mph before a CHP officer helped get the Prius driver to slow down and turn off the engine. EL CAJON, Calif. (AP) — A Toyota Prius that sped out of control on a California freeway was towed to a dealership Tuesday while federal and company inspectors converged on the car to determine whether a stuck gas pedal was to blame. The National Highway Traffic Safety Administration sent two investigators to examine the car after Monday’s incident, said Olivia Alair, a spokeswoman for the Department of Transportation, which oversees NHTSA. Toyota Motor Corp. spokesman Brian Lyons said the automaker is sending three of its own technicians to investigate. James Sikes, 61, of Jacumba, told authorities that the accelerator malfunctioned Monday as he drove his Prius on Interstate 8 in San Diego County. The car reached 94 mph during the 20 minutes before a California Highway Patrol officer helped get the Prius driver to slow down and turn off the engine. The CHP held the car overnight but it was towed to the dealership Tuesday, CHP Officer Brian Pennings said. The incident comes while Toyota is fighting fears over the safety of its vehicles, which had been revered for their safety and reliability. It was about 12 miles from where Sikes’ Prius started speeding where a deadly crash last year sparked scrutiny into the Japanese company’s vehicles. CHP Officer Mark Saylor, his wife, her brother and the couple’s daughter died after their Lexus’ accelerator became trapped by a wrong-size floor mat on a freeway in La Mesa. The loaner car hit a sport utility vehicle and burst into flames. Since then, Toyota has recalled some 8.5 million vehicles worldwide — more than 6 million in the United States — because of acceleration problems in multiple models and braking issues in the Prius. Regulators have linked 52 deaths to crashes allegedly caused by accelerator problems. On Monday, Toyota assembled a group of experts at its North American headquarters in Torrance, Calif., to refute studies by an Illinois professor who revved Toyota engines simply by short-circuiting the wiring. Toyota’s experts say the experiments were done under conditions that would never happen on the road. The company has blamed the issue on mechanical problems and floor mats that can wedge the gas pedal. “It wasn’t the floor mat. The floor mat we have has hooks on it,” Sikes’ wife, Patty, said in a telephone interview Tuesday. Patty Sikes said the family’s 2008 Prius appeared to have an accelerator malfunction a few weeks ago but it was brief. “It took off for a second, and then it just stopped. It was like a little hiccup or something,” she said. The family got a recall notice and took it to Toyota of El Cajon about two weeks ago but the dealership refused to examine the car, Patty Sikes said. “They said it must be a mistake because we weren’t on the (recall) list,” she said. The dealership declined to comment and referred requests for comment to Toyota’s corporate representatives. Toyota spokesman John Hanson confirmed that the 2008 Prius is part of Toyota’s recall to address unintended acceleration due to floor mat entrapment. The recall, affecting 5.6 million vehicles, was first announced in October. Hanson said a recall of this magnitude takes time, and Toyota first sends a preliminary notice to owners saying their vehicles are subject to a recall. A second notice comes later detailing how and where the vehicle can be fixed. At a news conference Monday, Sikes said he called 911 about 1:30 p.m. Monday after accelerating to pass another car on Interstate 8 near La Posta. “I pushed the gas pedal to pass a car and it did something kind of funny. … It jumped and it just stuck there,” he said. A patrol car pulled alongside the Prius and the officer told Sikes over a loudspeaker to push the brake pedal to the floor and apply the emergency brake. The braking, coupled with a steep rise on the freeway, slowed the car to about 50 mph. Sikes then shut off the engine and the car coasted to a stop. 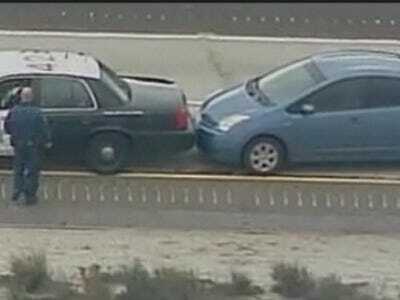 CHP Officer Todd Neibert then moved his vehicle in front of the Prius to block it as a precaution. Neibert is a 14-year veteran but he had no special training in halting runaway cars, Pennings said. Associated Press writers Stephen Manning in Washington, D.C., and Greg Risling in Los Angeles, and AP Auto Writer Dan Strumpf in New York contributed to this report.